A desired Industrial fan is selected in order to have a better environment in the working area. If we install a smaller fan in a larger area it will not provide the required amount of air or gas to the system for its functioning. Similarly, if we have a larger fan for a smaller working area or smaller functioning, it will result in wastage of energy and causes extra money to the organization. An efficient system provides the required operating conditions that increase performance and life of all components in the system. 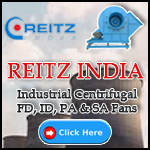 In case of ventilation system where cooling is given utmost importance, selecting a correct type of fan is very important. Similarly, in case of cold storage systems cooling requirement is important. In industrial terms flow rate is called as CFM (Cubic Feet per Minute). The CFM is the unit of flow rate of air or gas. A required capacity of an industrial fan is to be selected based on the amount of fluid to be transmitted. 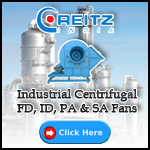 For a low pressure industrial work, axial fans are selected and similarly for high pressure industrial applications a centrifugal fan is selected. If, in an application the distance of travel of fluid is more, a fan with more motor capacity is selected in order to give high velocity for the fluid. The resistance to airflow caused by moving air through a pipe, duct, hose, and hood slots is called static pressure in a fan. Static pressure is expressed in terms of mm or cm. Static pressure is considered as the other physical properties such as volume (flow rate in this case) and temperature vary with the variation in the static pressure. By using the static pressure, we can find the rate of fluid to be delivered by a fan to the amount of cooling required in the system. By using static pressure, performance tables are developed which play an important role in the selection of an industrial fan. These are the tables developed on the temperature of the working area plotted against altitudes. system can be found out from this data and the required is selected with air temperature altitude correction tables. if the capacity and application are known.